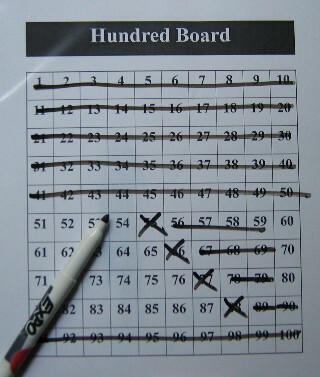 The hundred board is an important tool in mathematics. Young students use this tool to order numbers, to count on, to skip count, and to add or subtract by moving ahead or moving back. Older students use the hundred board to study factors and multiples. Through consistent use of this tool, students begin to appreciate the embedded patterns and use these patterns to solve problems. Hundred Board Logic Problems build on these patterns and require students to apply the mathematical concepts they have learned. 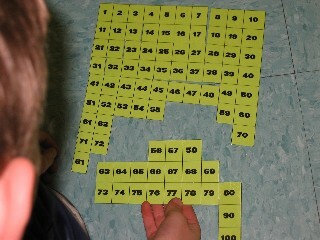 Strategy: Students use a hundred board to eliminate numbers after reading each clue. Students must apply their knowledge of even-odd, multiples and place value to successfully eliminate numbers until the solution is revealed. Download Hundred Board Template for student use in sheet protector. Each of these Mathwire.com webpages discusses activities and games that support student development of number sense and the concept of mathematical operations. 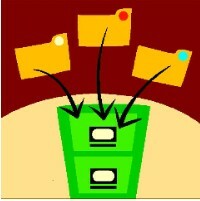 Pictures on each webpage capture students doing the activity or represent student work. PDF files are available for download with game mats, directions, recording sheets, etc. as required by each game or activity. Hundred Board Activities include hundred board puzzles, the Swiper missing numbers activity and How the Stars Fell into the Sky. 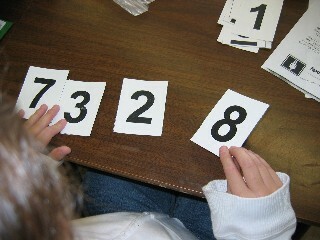 Place Value Activities include a School Day Count routine, place value games, Who Has? place value decks and problem solving tasks that assess student understanding of place value. More Place Value Activities include Number Line-Up, Build a Number, Decimal Build a Number, place value games and problem solving tasks. Number Sense Activities include Climb the Ladder, and assessments to measure student proficiency in generating equivalent names for numbers. More Number Sense Activities include games to develop number sense and fluency: Contig, 24 Game and Tribulation. Money Activities & Strategies includes strategies, activities and money games as well as links to math-literature connections for teaching money. Morning Math Routines includes pictures and descriptions of morning math routines that help students develop strong number sense through these daily activities: growing number line, school day count, calendar, coins for the date(school day), weather graph or tally and class attendance count. Who Has? Activities include discussion of the use of Who Has? decks to practice basic facts, classroom management ideas and assorted Who Has? decks to download. The decks are designed to be printed on 2x4 inch labels which can then be pasted onto index cards to create each deck. Games to Practice Multiplication Facts include Factor Blaster, Who Has? multiplication decks and links to additional online games. See Active Participation: Using Math Templates for information on using math templates to encourage active participation and to check student understanding throughout instruction. See more Number & Numerical Operations Math Templates: insert in sheet protectors for student use with dry erase markers or for teacher use as overhead transparencies. See Problem Solving Resources for open-ended assessments that involve number and numerical operations. See all Number & Numerical Operations Games. See Literature Connections for number and numerical operations. See more Number & Numerical Operations Links. See all Enrichment Activities for number and numerical operations.